Dinosaur Theme for Preschool: Hatching DINO Eggs – Early Math & Science. Learning about DINOSAURS is fascinating for preschoolers (and adults, too)! To help celebrate INTERNATIONAL DINOSAUR MONTH (October), the #playfulpreschool blogging team has developed special activities to explore a Dinosaur Theme with your own preschoolers at home or in the classroom! We hope your kids enjoy exploring, learning, creating, and playing with us! Fun Dinosaur Books to Introduce the Dinosaur Theme! Disclosure: This post and others within this blog contain affiliate links. For full disclosures, see the ABOUT section near the top of the page. Dinosaur Farm by Fran Preston-Gannon – this is a fun October dinosaur book as the farmer tends to his dinosaurs. If you haven’t picked up this new release, it’s a great one for the library at home or in the classroom! Oh My Oh My Oh Dinosaurs by Sandra Boynton – our toddlers and preschoolers still LOVE this book. Our copy is well worn, but the rhyme is second to none as only Sandra Boynton could do it! Dinosaur Roar by Paul and Henrietta Strickland – the classic book for a dinosaur theme! Paul Strickland is one of our favorite authors/illustrators! How do Dinosaurs Count to Ten? by Jane Yolen and Mark Teague – our 3’s love this book! PreK kids may tire of it, but our 3 yr. olds ask to read it anytime we learn about dinosaurs (or someone brings a toy dino to share)! 10 Terrible Dinosaurs by Paul Strickland – another classic dinosaur counting book that will keep older PreK kids engaged. 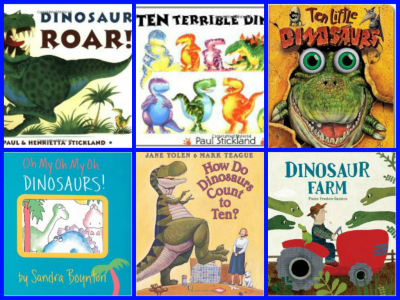 10 Little Dinosaurs – Pattie Schnetzler – our kids love this book (and we use the book as an introduction to many of our dinosaur math activities and the 5 hungry dinosaurs counting rhyme below). They all are very hungry, CHOMP, CHOMP, CHOMP! HATCHING DINO EGGS – a “What’s Missing?” math and colors game for preschool. Materials needed: Plastic Easter Eggs (Dinosaur Eggs) and miniature colored dinosaurs. Fill the plastic eggs with a different color of dinosaur. 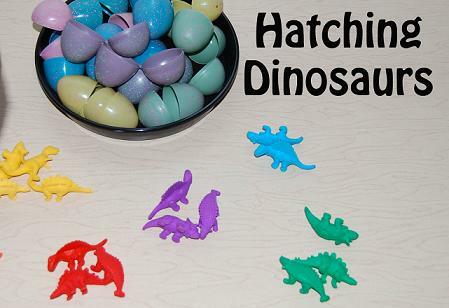 Invite the children to “hatch” the dinosaur eggs and place the dinosaurs in a row. Encourage the children to hide their eyes with their hands (NO PEEKING!). Remove one dinosaur and have the children count how many are now left. Continue until all the dinosaurs are gone. Note: the children might also try to guess which COLOR of dinosaur is missing from the row. For younger children use 5 or less dinosaur eggs to begin. Older children can use larger numbers of dinosaurs to play the game. Extension idea: Fill the eggs with different colors of dinosaurs. 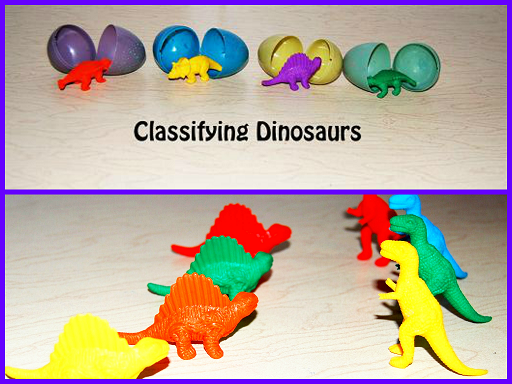 Have the children “hatch” all of the eggs then sort the dinosaurs and group by color or classify by TYPE of dinosaur. Set the dinosaurs out in several baskets according to the number of children you have. 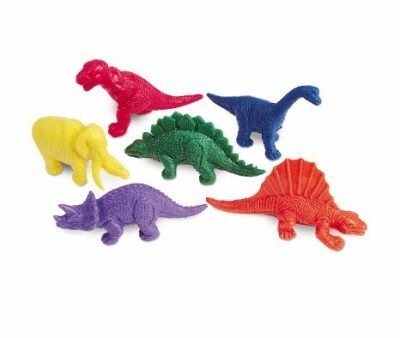 While pointing to the dinosaurs, have the children work together to sort the baskets of dinosaurs into different colors. Which set has more? Which set has less? How do we know? There are two ways to tell: as a group, the children can match the numbers in the sets one by one; or count the sets to see which number is greater (more). The children can also sort the colored dinosaurs and classify by what they ate: Meat or Plants (carnivore or herbivore). The children can sort the dinosaurs by type/dinosaur name. « Starry Night by Vincent Van Gogh for #PlayfulPreschool! Those dino counters are on our wishlist! Devany – I have two sets and we use them all the time. I usually have to go FIND them when we need counters as our kids use them for small world farm play. :) TY for your comment! These are wonderful learning activities. I love the idea of having children guess which color dinosaur was taken away. That is a great memory challenge! Theresa – memory challenges are fun! We play all kinds with our kids…sometimes, they are better than I am at remembering:) TY for your comment! Great ideas! Love the rhyme and will be using it with both kids today! 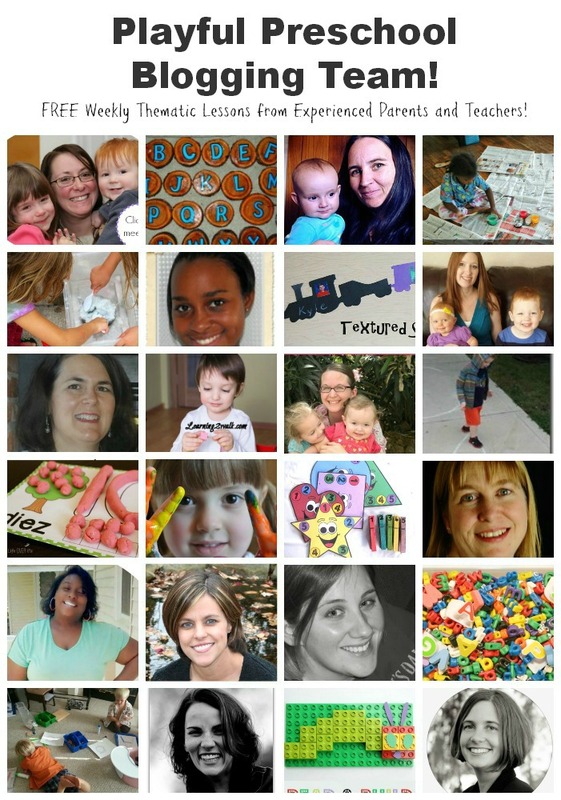 Danielle – our kids love it, too! Thanks so much for your comment! Oh! I love this idea. I have loads of Easter eggs left over from throughout the years that we can use for this activity. Natasha – we have loads of Easter Eggs too as I always hide them from myself (then find the day AFTER Easter)! :) Thanks for visiting and your comment! Love this activity – I wish we could easily get plastic eggs in the UK I will have to order some to do this as for our Dino Party this year I found mini sets of dinosaurs. Cerys – it would be great fun at a party! Our kids hide the dino eggs and do dino egg hunts for each other! It’s like EASTER during DINO DAYS:) lol. TY for your comment! The dino rhyme is so cute. Can’t wait to sing it with my kids. Jodie – it’s a cute one to do with the dinosaur theme! :) TY for your comment! Fun! What a great idea to hatch the dinos from plastic eggs like that. Colleen – thanks for visiting and your kind comment! It’s fun!